This delicate image truly inspires simplicity, beauty and class. Sometimes less is more and with this stunning design this is personified. The soft clear ice flake is a beautiful snowflake shape and looks very striking against the plain dark background. The flake itself looks like it’s made from glass it’s just so perfect! From the centre of the flake, it looks frosted and clear, almost translucent, creating beautiful light. This image would be a great template to use for your message this Christmas time, and is bound to impress your clients this year. 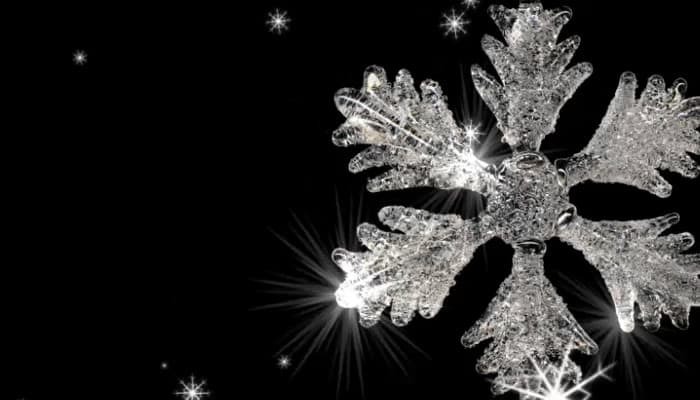 As the ecards play the snowflake glistens and gleams with animation, making the effect all the more lovely. The black background looks fantastic with white text and gives a really stylish twist. Many of our clientele go for the simple designs, especially as the animation is so effective, it just finishes off the holiday ecards for business. At Ecard Shack we have many different designs to choose from, please feel free to view our range of designs and music selections we have to make your card really special this year. Simply register an account free of charge and you are more than welcome to design as many electronic holiday cards for business as you like!